string(3) "709" string(3) "712" string(2) "53" string(3) "941"
Vision Quest: A Ritual for Elephant & Castle is part documentary, part performance, part archive – exploring the major transitions currently taking place in the south London neighbourhood. The film follows Coates on an unlikely suburban journey as he sets out on a Vision Quest, seeking animal spirits to help gain insight into a possible future for the failing redevelopment scheme. In response to the Council’s formal vision and master plan for Elephant and Castle, Coates involves residents from the now demolished Heygate Estate, council planners and developers to evoke an alternative collective vision of what it could be. Vision Quest: A Ritual for Elephant & Castle is the conclusion of an local residency undertaken by Marcus Coates over a 4 year period (2009 / 2012). 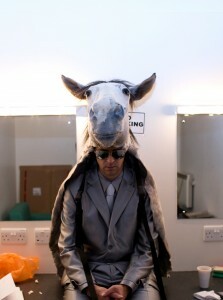 At the centre of the film is the improvised live rock-shamanic-ritual collaboration between Coates and Chrome Hoof staged within the legendary Coronet Theatre, one of the oldest buildings in the area. Coates performs an improvised ritual, supported by Chrome Hoof and Wildbirds & Peacedrums, marking the passing of the neighbourhood and to envisage a new strategy for development that does not repeat the mistakes of the last redevelopment in the 60’s. Elephant and Castle has undergone successive redevelopments since the post war era. Each has been characterised by the imposition of extensive masterplans to solve increasing social housing needs and decreasing social prosperity. The latest master plan – originally due to be completed by 2009 – has been stalled, having started development over 10 years ago. Meanwhile the re-housing of long-term residents away from the area and the demolition of their homes continues to undermine the social fabric of this historic area. Vision Quest: A Ritual for Elephant and Castle (2012, 51”12 mins) is a Marcus Coates film, commissioned & produced by Nomad Projects and co-directed by Marcus Coates and Michael Smythe. Cinematography by Annemarie Lean-Vercoe, editing by Ariadna Fatjo-Vilas. 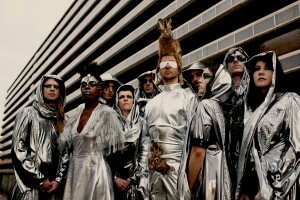 The Vision Quest residency included ‘A Ritual for Elephant & Castle’, a shamanic music fuelled ritual performed in collaboration with Chrome Hoof and Wildbirds & Peacedrums, at the Coronet Theatre on the 5th of June 2009. The collusion of artist / shapeshifter Marcus Coates and the thunder, rock and disco of the mighty Chrome Hoof is a fanciful and fantastic proposition add to this cauldron percussive raw energy of Wildbirds & Peacedrums, backed up by a 20 piece drum circle. Marcus Coates' practice questions how we perceive human-ness through self designed rituals informed by traditional cultures, often seeking resolutions to social issues for clients. He has performed ‘consultations’ with Ikebukuru Council, Tokyo, Japan; The Mayor of Holon, Israel; a Residents Housing Association in Liverpool, UK; and the City Council of Stavanger, Norway. Coates’ videos, performances and installations have been shown internationally, and he has received awards including the Paul Hamlyn Visual Arts Award 2008 and the Diawa Foundation Art Prize 2009. He was the Calouste Gulbenkian Artist in Residence in the Galapagos Islands, Ecuador, 2008. Recent shows include: The Trip, Serpentine Gallery, London, 2011; Questions & Answers, Kate MacGarry, London, 2010; Dawn Chorus, ESPAI 13 / Fundació Joan Miró, Barcelona, Spain, 2010; and Psychopomp, Milton Keynes Gallery, UK, 2010. Wildbirds & Peacedrums duo (Wallentin and Werliin) met in 2004 whilst studying at the Academy of Music and Drama in Gothenburg, Sweden. They married a year later and formed Wildbirds & Peacedrums in 2007. Their music primarily consists of drums, percussion and vocals, with Wallentin also playing the string instrument the cittre, pump-organs and steel-pan on some songs. The band released their first album Heartcore in 2008, originally through Swedish label Found You Recordings, and later licensed to The Leaf Label for the rest of the world. That year, they were awarded the Årets Jazz i Sverige (Swedish Jazz Act of the Year), which funded the recording of their second album, The Snake, released in 2009.